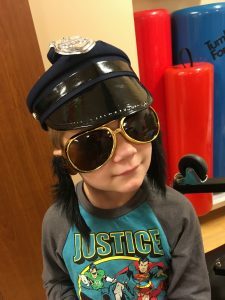 Intensive Therapy - Feb. 2018 - Adventures with the Tuleys! 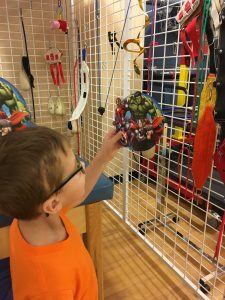 During the month of February, Josiah took a month off of school to focus on Physical (PT), Occupational (OT) and Speech therapies. 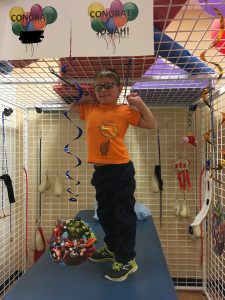 Over the course of four weeks, Josiah had 3 hours of PT 5x/week, 2 hours of OT 3x/week and 1 hour of speech 2x/week. Needless to say, Josiah was pretty worn out and ready for the weekend breaks! This is called Intensive Therapy. BUT, he did absolutely amazing! The amount of progress we saw, along with the confidence he now has, proved to be worth all his hard work and the 30 minute drive one-way every day. Josiah met all his goals but one, and he was only shy meeting that goal by 1 second. We’ve taken the month of March off of therapy and are working on getting him back into the school routine. The first week was a little rough. We were also given a home program, so Josiah can keep working on those skills while at home. He really enjoys doing his exercises. Physical therapy focused on gaining balance and strength. Prior to intensive, Josiah was only able to stand on his right leg for maybe a second. He can now stand for 4 seconds. (His goal was 5, and this was the goal he hadn’t quite met – but we’re working on it!) 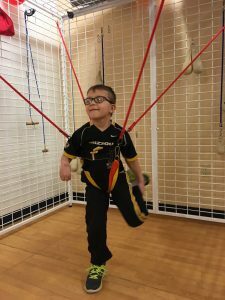 He is also able to hop on his right leg, gaining a small amount of clearance, whereas before, his foot would never leave the ground. He is so excited about this, he’s constantly grabbing onto the dishwasher handle to help balance himself to show us he can jump on his right leg. One major thing we noticed, is his ability to walk around our home. Our house sits in the middle of a hill. Josiah used to need someone to hold his hand as he walked up the driveway or down the hill to the trampoline. A few days ago, Josiah informed us he was going to the trampoline – and he went all by himself! By the time I had my shoes on, he was already down the hill jumping, whereas before, he would’ve been waiting outside for someone to help him down the hill. I love the amount of independence he’s gained! Occupational therapy had two focuses. First, he worked on using is vision for visual-motor tasks. These included dot-to-dot, scanning, etc. He had a strong dislike for this, as it proved very difficult for him. The second focus was on using his right hand, as well as a goal for being able to dress himself. During this time, he learned how to put on his socks. It seems like such a simple thing, but you try to get your sock on with one hand – the crew socks aren’t so bad, but the sock for his brace goes up past his knee! We’ve seen an increase of Josiah’s willingness to use his right hand for tasks. He’s constantly putting things into his right hand (he’s not able to pick most things up, but can hold onto them once something is in his hand.) He also likes using his right hand to open the drawers in the kitchen. I love seeing him have success! 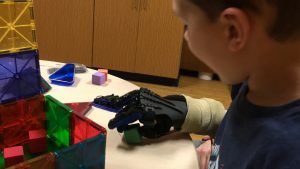 During OT, Josiah’s therapist made him a glove/splint that helps him pick things up easier. He improved greatly on this task. At first, a cast was made to place over his left arm and hand to keep him from being able to use his left hand, requiring him to use the right. After the first session, we didn’t have to put the cast back on him, because just the threat of the cast was enough to make him leave his left hand down and only use his right. He struggled so much at first, but by the end of the four weeks, he could pick up and release foam blocks with little to no effort! We have some blocks we are using at home, and hope to work up to heavier and/or larger items. It’s great seeing him get so excited with his own progress, as well as finally seeing some self-motivation, which makes it easier to work on these things with him. Speech therapy went really well, and he enjoys working on the concepts he learned. The activities were fun, and although difficult, he picked up on them rather quickly. 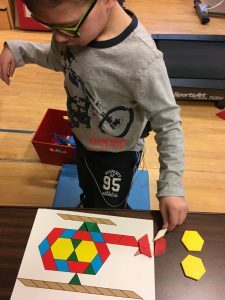 He worked on abstract thinking skills, which included categorizing and answering why questions. While some of his answers aren’t always on target, they’re not always wrong either. This makes watching him during therapy fun, because we get to see what’s going on inside his little brain! At the end of intensive, he had a party. One of Josiah’s favorite toys to play while there were Magna-Tiles. Every day he would build a jail with the tiles, and each day the jails were more elaborate than before. Josiah also had a favorite phrase to use during PT. 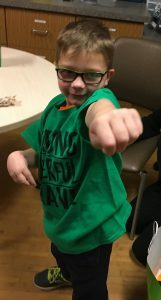 He’d say “STRONG, POWERFUL, BRAVE!” During the party, his therapists gave him a gift of Magna-Tiles and a green shirt that says “Strong, Powerful, Brave.” He was so excited for both and plays with the tiles every day and would wear the shirt every day if I’d let him! Josiah will start back up with PT and OT in April for once a week. He’ll also get botox in his elbow and leg in about a month. Thanks to all who prayed for Josiah during this time, as it was both physically and mentally exhausting for him. He did amazing, and we are planning to complete another intensive session in the fall. Way to go Josiah??????????? ?you did great. Keep up the good work. We are cheering for you at our house. Praise the Lord–that is so encouraging.. It is delightful that he is doing so well. I like the fact that he is wanting to do things on his own. That’s so exciting. He’s such a darling (all your kids are) it is wonderful to hear about his progress. ❤️???? Thank you! 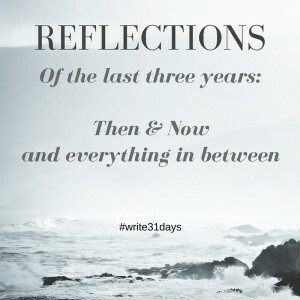 I’m not able to write as often these days, but I love getting to write about progress!